With small, compact cars becoming so popular with car buyers, the Toyota iQ is just another wonderful addition to Toyota’s outstanding range of small cars. This car feels like premium quality, compared to other cars of its kind. It features a beautiful finish and stylish exterior, which has clearly been designed to look like a high-class city vehicle. This model also comes with all the reliability of Toyota, so buyers can enjoy a high-performing engine and efficiency, combined with its good-looking exterior. You can get great deals on a range of used Toyota iQs at RAC Cars, with a variety to choose from. You can almost always expect high build-quality and economic efficiency with Toyota, so you can rely on one of the used Toyota iQs for sale, being reliable. You’ll also be getting a car that is fast and can dart through the roads and is also easy to park. But, there is room for three adults and a child into a footprint barely larger than a Smart fourtwo. Toyota has done a fantastic job of cramming big car ride refinement into the little iQ. It feels more suited to urban roads, but it can also easily manage motorway speeds without any trouble. The ride feels assured, especially around corners, where there is also little body roll. The bigger engine gives a pleasurable driving experience but, whatever model you go for, you will not feel short-changed by this short little marvel from Toyota. 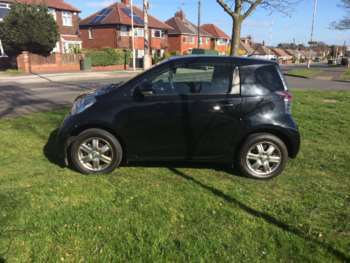 Got a specific Toyota IQ model in mind?